Last week's Gmail outage is just the latest in a long series of outages in our favourite webmail application, but you don't have to let that stop you from accessing your email and getting things done. Just because the Gmail web interface went down doesn't mean that Gmail is entirely down—often you can continue to access your account using one of the alternate web interfaces, which often are still accessible even when the regular web interface goes down. Your best bet is to bookmark the link for the Plain HTML version of Gmail (or just bookmark this post), so you can quickly switch to this alternate mode if Gmail is giving you trouble loading. http://mail.google.com/mail/?ui=html. 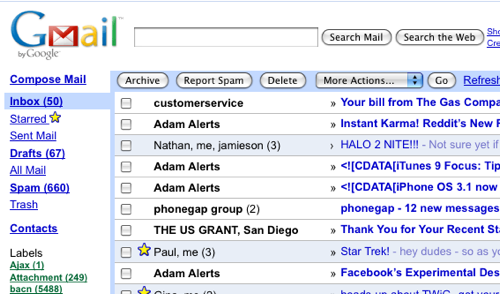 It doesn't have all the fancy features that regular old Gmail does, but it can do the job just fine in a pinch. If you use a lot of different Gmail Labs features, you might find that some of them will conflict with each other, or possibly cause Gmail to stop working. You can use the Safe Mode link to disable all the Labs features and hopefully get Gmail back up and running again. Just visit this URL: http://mail.google.com/mail/?labs=0. Some people recommend using the older version or bypassing browser checking links, but they won't let you access the Labs settings. You can access the mobile phone versions of Gmail from your desktop computer, although they are very stripped down and lacking features. You'll be better off with the Plain HTML version, but in a pinch you can try the regular mobile version http://mail.google.com/mail/?ui=mobile or the more user-friendly iPhone version http://mail.google.com/mail/x/gdlakb-/gp/. If you haven't already checked out the Google Gears-powered offline mode for Gmail, this is a must-use for anybody that really depends on Gmail access. You can continue to use your email whether Gmail is running or not, or even when your own internet goes out. It's not perfect, since it doesn't store every single email in your inbox locally, but it does store enough email to be a great solution. The biggest benefit in daily use is the Flaky Connection Mode, which is a hybrid between the offline and online modes, and makes Gmail response time much faster for everyday email tasks for those on slower connections. In this mode, Gmail effectively works like a desktop client. During the last Gmail outage, IMAP and POP3 access weren't affected at all, so those using a desktop or mobile client to access their email were still able to send and receive without even knowing there was an issue. Even if you use the web interface as your primary method of email access, it's a good idea to at least keep a Thunderbird installation setup with IMAP access to your email in a pinch. Setting up Gmail in Thunderbird has turned into an easy process, requiring only a few clicks through the account settings. If you are an Outlook user, you can follow a detailed guide I've written to setup IMAP in Outlook 2007. If you've got a mobile phone, the Gmail Help site has instructions on setting up just about any smart phone with IMAP access to your email. Gmail doesn't have to go down globally for your email access to be cut off—your internet could go down, or your account could even be disabled. Whatever the case, it's a good idea to have a backup plan just in case the worst should happen. We've got you covered with a number of methods for backing up your Gmail, starting with the really obvious solution of just using Thunderbird to backup your email with POP access, but you can backup your email with Fetchmail on Windows, Getmail on Linux, or the standalone Gmail Backup tool. What email accessing workaround, if any, worked for you during the last Gmail outage? Let us know in the comments. The How-To Geek nervously wore the letters off the F5 key during the last Gmail outage, and hopes it doesn't happen again—Ever! His geeky articles can be found daily here on Lifehacker, How-To Geek, and Twitter. Alas the iGoogle gadget still doesn't work for people using https. Hopefully sometime this century Google will eventually fix this. Grr. The following is a good reason why Google apps and the cloud should not be relied upon for commercial purposes. Up until now, we use Google Apps exclusively for email, address book, calendar in our office. Today we cannot access our email. I am wondering is it just us or the whole system, so I go and check the status of Gmail, which indicates the system is OK. So we have a problem. As many would know, you cannot contact Google by post or telephone like normal businesses. You need to send them an email message or online form. Your email is not working so that is out of the question, which leaves the online form. As a paying customer, we are actually entitled to get support (unlike the users of the free version). To do this, you need to fill in an online form giving our ID and PIN number, without which you do not get past the first screen. The ID and Pin are in the setup email they sent to you which you can;t access because you cannot access email. But you can also log into your control panel which lists your ID and PIN, unfortunately I can't log into that either. So now we have the perfect problem, no access to some of the most important information in our business, not being able to identify the problem and no means of seeking support from the service provider, who is blissfully ignorant of the situation. It is now Saturday and first thing we will be doing Monday is dump Google apps. can any of u help me out.. have a freind on gmail..havnt been able to get in contact with her for past 2 weeks...all contact just stoped cold and this is highly unusual. i am concerned about her welfair.. the only contact i have is her email address and that is coming back...postmaster thingy. is there any way of finding out her full name/ph no..address etc from an email address. i would even be happy for a third party to contact her for me with me being ignorant of her private detials. NOTE PLEASE...this is genuine and not any type of scam etc...regards chris.